I love the smell of homemade brownies. Waiting for these chocolatey brownies to cool is optional! These Homemade Brownies are extra chocolatey and made completely from scratch. With this homemade brownie recipe, you’ll never need a box mix again! We love these rich brownies with dense, fudgy middles and crinkly tops. They are so simple to make and they taste amazing. You certainly will be able to taste the homemade difference. If you are looking for a go-to brownie recipe to add to your baking repertoire, we think this is the BEST homemade brownies recipe out there. It is sure to cure all those cocoa cravings and can be mixed up in minutes. I know what you may be thinking–you are too busy for homemade brownies AND the box is just so convenient. Take the homemade challenge and once you taste the difference, you won’t be going back to the box. The best part is the recipe goes together quickly and fills a 12 X 18 pan so it feeds a crowd. The ingredients are simple and should become a staple in your pantry. You never know when you might need a quick dessert for unexpected company, and these brownies will certainly make them feel like special guests! It is the perfect dessert to take to a potluck or a picnic. Children AND adults will be coming back for a second brownie as this recipe stands above the rest. Spray the baking pan with cookie spray, then line with parchment paper and spray again. Once brownies are chilled, they can be removed from the pan then cut into squares. The brownies can be made ahead and frozen. Wrap tightly with plastic wrap and foil to keep them fresh. 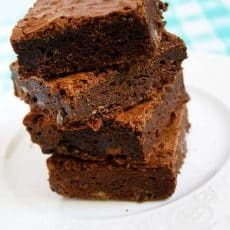 My most favorite brownies and they feed a crowd! Sift together the flour, cocoa powder, and salt in a bowl and stir to mix. Cream together the eggs, sugar, butter and vanilla in a separate bowl until well blended. Add the flour mixture to the butter mixture and mix just until all the dry ingredients are moistened. Do not over mix. Fold in the walnuts and chocolate chips and stir to blend. Spread the batter evenly into the prepared pan. Bake 35 to 40 minutes, until the brownies are firm to touch. They will be slightly soft in the center when tested with a toothpick. Remove from the oven and cool about 40 minutes before cutting. Trim the edges and cut into 2 1/2 by 3-inch bars. To make cutting the brownies easier, refrigerate brownies a couple of hours or overnight. Lift parchment to remove brownies from pan before cutting. We would like to believe we are brownie connoisseurs! We love baking brownies (and eating them)! Hopefully, these recipes will inspire you to teach the next generation about homemade recipes and cooking from scratch. The times spent in the kitchen together baking brownies will certainly be part of making some wonderful memories. Looking for some unusual but delicious brownie recipes? Try these brownies with a crunchy topping. 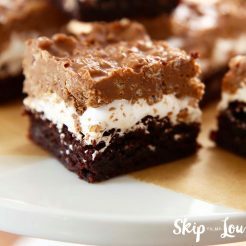 They are super moist and topped with creamy marshmallow and chocolatey rice layers. If you like the combination of chocolate and peanut butter, these brownies are three layers of perfection and the chocolatey rice layer gives them a unique texture. I guarantee they won’t last long once they are sliced into squares! YUM! 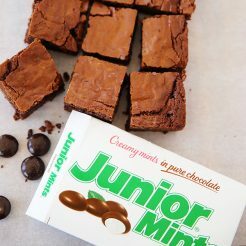 If you love the combination of chocolate and mint, these Junior Mint brownies are gooey and minty! Candy added to a brownie…What’s not to love? They are the perfect treat for a movie night. No time to make up a pan of brownies but still need a chocolate fix? 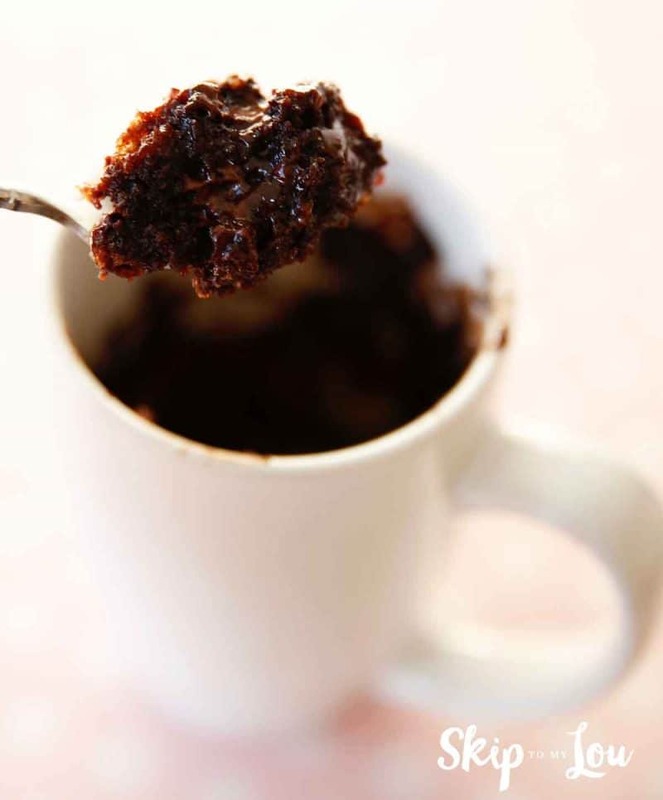 This chocolate mug cake is a family favorite for sweet cravings! It takes only a few minutes to have a dense fudgy treat! I like it baked just at 1 min 45 seconds. This leaves a bit of warm chocolate batter just like a lava cake. YUM! Can this be halved for a 9x13? I haven't tried that Jennifer, but I don't see why it couldn't be. I will say these brownies freeze beautifully and are great to have on hand! best brownie recipe I’ve ever made! Delicious! WOW Jennifer! I am so happy you loved them! OH.MY.STARS! They look and sound fabulous. And all that vanilla! They have to be the best. Thanks for sharing your grandma's amazing recipe. Pinning to make later! These sound awesome! I am going to try them for a family reunion we have coming up. This recipe is so easy and they are delish! I was in need of a big batch for a youth group event so I made these. They are beyond awesome! They bake up very nicely and are YUMMY! I modified by using only 1/2 lb. butter (2 sticks instead of 4). I replaced the rest with two 5.3 oz.containers of Fage plain Greek yogurt. I think Brownies can be too greasy with so much butter. They turned out perfectly! If you are cooking for a crowd, you can't beat these!!! I'm excited to try this. I have a question. I've heard that you can use mashed white beans as half of the oil in brownies. 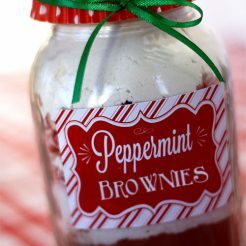 Is that only for boxed mixes or would it work in a homemade recipe like this? Found this recipe on 'Pinterest' and immediately tried it. It is a simple and 'all you need' recipe. 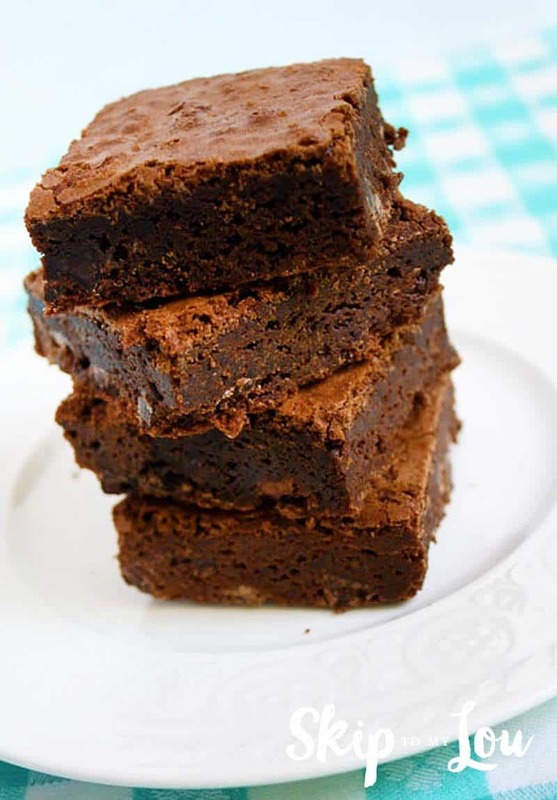 SQo many brownie recipes are dry and not really chocolatey tasting-but these are perfect! I dislike when people write how they modified a recipe, although sometime helpful, I must say just two things. I used excellent Cocoa Powder and instead of using chocolate chips I chopped up excellent quality chocolate bars. I did add a little bit more than called for. Over 15 people tried them and they all want the recipe very seriously!!! Thanks I am keeping this one forever! So happy you liked them, Heidi! Wow, 15 people I guess makes it true! These are great brownies!! Do you mean a `9 x 13 inch pan? I have never in my life heard of a 12 x 8 pan? Hi Cyndi, It makes a ton of brownies you need a 12" X 18" pan. These look amazing! If only I could have them right now... perfect for my after lunch snack. Thanks for sharing the recipe. Wow!! These sound great, look great and taste great!! And they are automatically our family's favorite!! Thanks for sharing this recipe!! I made these yesterday and served them at a party. They were a hit!!! So moist and fudgy. Yum! Thanks!!! You can't go wrong with brownies in my book! and the bigger the recipe, the better. Thanks for a great recipe! I was searching for another blog with almost the same title and yours came up. Glad it did because I love your brownie recipe, and how gorgeous it turned out. When I make brownies the small batch is never enough...it is gone in minutes. I would love to try this recipe, very rich and fudgy! Could you half this and cook in a 8x8 or 9x9 pan? You're joking right???? Leave them for an hour or overnight? Obviously, you've never been around us when a pan of brownies comes out of the oven. It's all we can do to leave them sitting for more than 15 minutes!!! We don't worry about cutting them, we just do the best we can to dish 'em up & eat 'em with a fork! Thanks for the new recipe, tho...sounds delish!! Guess why I just sat down at the computer...? I'm waiting for a batch of brownies to come out of the oven! How funny! These are THE BEST brownies! I had to try them today & they are sinfully great! Thanks for sharing this gem! Perfect timing . My daughter comes back from Japan tomorrow and she LOVES brownies! Those look delightful!!! I'll have to give these a try!